I write this post because I was involved in a real-life CFT rollback - and it was totally my fault! We were consolidating some 7-Mode HA-Pairs to a cDOT HA-Pair, and I messed up checking the disk count, so the CFT process failed because it needed to exceed the destinations platform limit for number of storage devices (assigned disks) - the silver-lining is that a pre-check will be added to 7MTT in the future to prevent this. 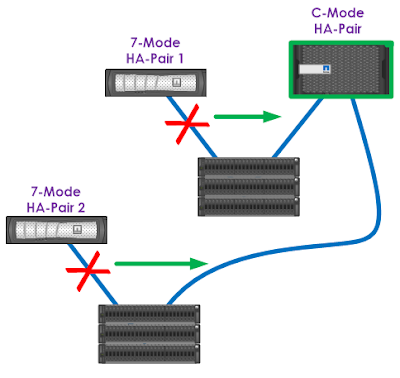 Most CFT’s are 7-Mode HA-Pair to cDOT HA-Pair (1:1) - I’m not sure how many people are aware of the possibilities for reducing controller count with CFT - so the scenario encountered is very rare. If you encounter an issue where you need to rollback CFT, in the ‘Migration Dashboard’ for the CFT Project, you click the “Go to Rollback Dashboard” button. Note: Call NetApp support first to see if there is a way forward, or simply if you’re stuck and don’t know what to do. This runs through several pre-checks to confirm you’re good to proceed with rollback. This generates an output of commands that you need to apply to the Cluster via the Clustershell, and 7-Mode shell commands for later. You can save as CSV. Note i: You need the commands from the CFT Rollback Manual Steps output! Note ii: There’s a revert for every aggregate that was on 7-Mode. Note iii: You might need to repeat the command multiple times (if the later show-status doesn’t show “revert_complete”) - but if you’ve tried 3+ times and it’s still not “revert_complete” then something is wrong! Note iv: All the disks that were in the aggregate need to have been assigned to the correct cDOT nodes for this to work. Note v: If aggregates on cDOT conflict with names of aggregates on the old 7-Mode controllers, rename the pre-existing cDOT aggregates first, then try again. Note: DO NOT PROCEED if any aggregate does not report revert_complete. Note ii: It can take ~10 seconds per disk assign. Note: DO NOT PROCEED until disk assignment is correct. Note: You need the command from the CFT Rollback Manual Steps output! - Wait a few minutes for the shelves to initialize. Power on the 7-Mode controllers. The 7-Mode controllers will boot to the Boot Menu. This might look a fair few steps, 7MTT packages everything very nicely though (this was version 3.1). 7MTT makes it very straightforward - simple buttons to press, and the “Generate Rollback Steps” output gives you everything you need for a successful rollback (which hopefully you’ll never need to do).